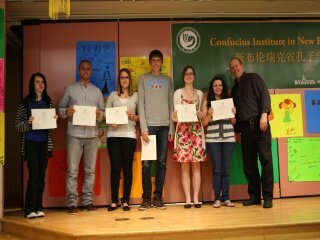 The graduation ceremony of Chinese classes in the high schools in the Great Moncton Area was held on June 6, 2011 in Edith Cavell. 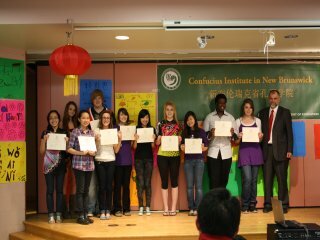 All the 40 students, having completed their one term Chinese study and passed the examination, got their certificate from Confucius Institute in New Brunswick. 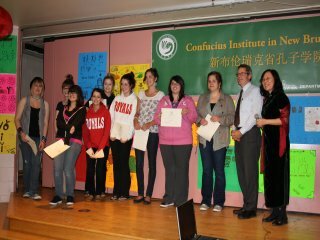 Some official from the district educational bureau and the principals from the high schools attended the ceremony. 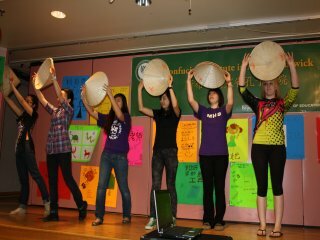 The students drawn some pictures and wrote some Chinese characters to show what they have learned about Chinese, and all the students from the three different schools made some performances of tongue twister, reciting Tang poems and singing Tian Mimi in Chinese and doing the fan dancing and straw-hat dancing. 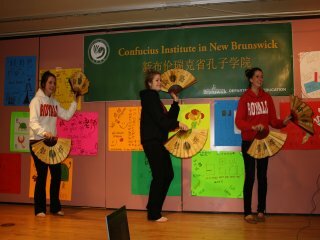 All the three high schools hoped that CINB would continue to offer Chinese courses in their schools so that their students could get to know more about Chinese culture and in this way to create more study and work opportunities. One student will go to Qufu Normal University, which is located in Shandong province, China, to study Chinese for one year with the scholarship.